Constantly at the forefront of innovation, Fujitsu holds the most AI patents in the world. One of the largest IT service providers globally – with customers in over 100 countries – they are focused on operational excellence, internally and externally. They’ve used RPA to provide a consistent quality of service, while improving delivery, security and resource flexibility. 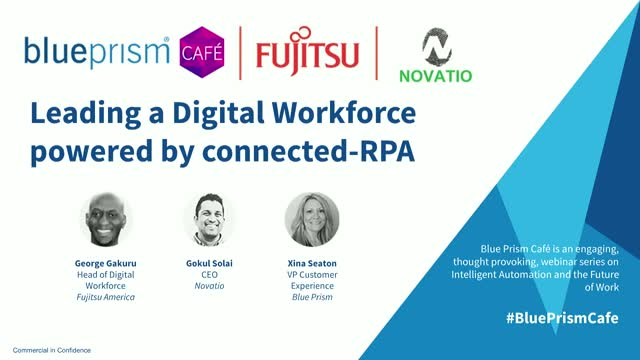 This episode of our Blue Prism Café will showcase how Fujitsu have embraced and leveraged their Digital Workforce since adopting Blue Prism RPA in 2016 and how it has driven results through their internal optimisation program, breaking down silos and delivering incredible productivity along the way. The Café will also get an insight into how Fujitsu and their partners Novatio see connected-RPA deployment evolving their internal processes and partner eco-systems, and how it can dovetail with AI technologies in 2019 and beyond. • How their cloud-based Digital Workforce powers their multiple automation resources. • An in-depth look at how RPA enable Fujitsu to optimise their Network Operations Centre, delivering incredible ROI. • What’s next for Fujitsu and Novatio in the Connected RPA world. This live webinar will include a Q&A with the audience: make sure you pre-register and join us live on March the 12th 2019. This session will be recorded and available on-demand on this website. Would you appreciate a helping hand to smooth out the seasonal peaks in your workload? With an automated and connected Digital Workforce in place, you always have access to a flexible set of workers, ready to step into the breach. H&R Block is a world leader in tax preparation, so tax season brings a real peak in the company’s workload. Using Blue Prism’s connected-RPA has transformed the organization’s ability to react to, deal with and streamline their busy season. During tax season, H&R Block found their operational resources being stretched to maximum capacity. The company needed to process large amounts of incoming paperwork and license renewals, as well as processing and outputting financial data and call-centre email responses in the most efficient ways. Implementing a connected Blue Prism Digital Workforce, in tandem with Microsoft Cognitive Services, allowed H&R block to create automated end-to-end processes and reallocate support to the areas of the business that most needed assistance. With Blue Prism’s connected-RPA, your organization has a flexible Digital Workforce that’s ready to pick up the slack when busy season hits – taking the stress off your people, streamlining operations and helping you react to dynamic workload changes. Make sure to pre-register and join us on May 14. If you can’t make it on the day, a recording will be available on our Webinar page, after the event. Equinix, providers of carrier-neutral interconnection capabilities and data centers, embarked on a Supply Chain Digital Transformation program that spanned people, process and technology. As a part of that journey, they recently introduced Optical Character Recognition to open the eyes of their Digital Workers and adding efficiencies and accuracy to their internal operations. Working closely with WonderBotz, Equinix has transformed a range of accounts payable tasks and will soon be automating account reconciliation and customer service. In this webinar, we’ll look at their procure-to-pay process and will see how RPA and OCR have boosted both accuracy and productivity. This one automation is projected to free up 14,000+ hours per year for their finance team, increasing focus on higher-value tasks and cutting time from the procurement cycle. Connecting your RPA solution to OCR tools allows your Digital Workforce to scan paperwork, PDFs or digital forms – digitizing the information that’s contained. Whether it’s an invoice that needs processing, or a customer request that needs actioning, your Digital Workers can automatically ‘see’ the contents and turn that resulting data into a meaningful output for the business. Make sure to pre-register and join us on April 9, 2019. If you can’t make it on the day, a recording will be available on our webinar page, after the event. On March 28th, Matt Juden-Bloomfield, Head of RPA at Blue Prism, will be hosting our next webinar, where we’ll be announcing the customer winners of our prestigious Excellence in Enterprise RPA Awards. You’ll also have the chance to talk to Pat Geary, Chief Evangelist at Blue Prism, about the future of RPA. The Excellence in Enterprise RPA Awards is our annual celebration of RPA success, helping us to recognise the innovation and dedication of our growing customer base. We’ll be announcing the finalists of our customer awards and telling you how these RPA success stories have helped to drive the digital transformation and business efficiency of our leading RPA customers. RPA has come a long way in the 17 years since Blue Prism first brought the innovation and efficiency of the Digital Workforce to the global market. And who better to talk about the future path of connected-RPA than Pat Geary, Chief Evangelist at Blue Prism, who coined the term and invented the industry back in 2012? Pat will be giving his key insights into the history and future direction of RPA, and will be answering your questions on the next stage of evolution when it comes to automation, digital transformation and the world of connected digital solutions. ● Take part in a live-audience Q&A with Pat Geary and Matt Juden-Bloomfield, Head of RPA, Blue Prism. If you have a burning RPA-related question to ask, make sure to pre-register and join us on March 28th for this webinar. If you can’t make it on the day, you can easily watch a recording of the session from our webinar page, after the event. Process Discovery has often been highlighted by our customers as one of their leading challenges in scaling their RPA capability. This process can be a time-intensive and inaccurate yet keeping automation pipelines full is imperative to achieving maximum ROI and efficiencies for RPA investments. What do you do with your Digital Workforce if they don’t have any work? Our panellists are excited to introduce Blue Prism's new Process Discovery tool—a web-based tool available to all Blue Prism customers that simplifies the task of analyzing and qualifying processes for automation readiness, ease of automation and potential business value. This Process Discovery tool takes the guesswork out of process discovery and clearly displays each process on a dashboard quadrant ranking each in terms of most automation-ready to least, overlaid with their relative benefit opportunity. The result is an objective, consistent, and reliable way of discovering automation-ready processes. Our expert panellists will show you how easy process discovery can be and you’ll leave with an understanding of how your business can repeatedly and sustainably deploy RPA with strategic insight regarding potential ease-of-automation, hours-returned-to-the-business and potential savings. This live webinar will include a live-audience Q&A, so make sure to pre-register and join us on February 28th. If you cannot make it on the day, a recording will be made available online afterwards. The people, talent and structure behind the Digital Workforce are as important as the technology itself, but when you’re looking for capacity to scale up an RPA program – or even take your first steps – it’s hard. Where do you even start? Do you train up your own staff, or do you go out to the market, where it could take you months to find the people you need, if you can find them at all? In this episode of our Blue Prism Café, hear from leading Canadian supermarket-chain Loblaw on how they tackled the "human side" of the Digital Workforce in their 1st year, and how building a long-term sustainable training, career growth and upskilling plan was critical to their first set of success and how it's setting them up for serene scalability. This webinar will be chaired by Blue Prism's own Head of RPA, in conversation with the RPA team at Loblaw, Robiquity, a multi award-winning robotic process automation (RPA) enablement business, as well as Blue Prism's Global Head of Education Services. This live webinar will include a live-audience Q&A, so make sure to pre-register and join us on February 12th. If you cannot make it on the day, a recording will be made available online afterwards. Following the launch of the Blue Prism Digital Exchange, come and join us for our inaugural Pulse Online Webinar to see the platform in action, as well as a demo of the new features of Blue Prism's v6.4. The Digital Exchange (DX) is a “shop window” for finding & consuming pre-built AI, cognitive & disruptive technologies. The DX gives global enterprise customers direct access to technologies from Blue Prism and its technology partners as downloadable connectors, reusable Visual Business Objects (VBOs) or via referrals to the partner via an easy-to-use storefront. Thanks to a robust ecosystem of partners, Blue Prism customers can instantly execute their choice of AI, Machine Learning, Analytics, OCR & more through open API’s. * Simple drag & drop functionality. * New Web API Services (‘API Configurator’) facilitates easier integration of APIs. * Simplifies web services within a process flow. Pulse Online is Blue Prism’s product and technology focused webinar series. Every last Thursday of the month, get hands-on demos, tactical insight and best practices for taking your Digital Workforce to the next level. Insurance companies have an opportunity to leapfrog generations of technology advancements and are driving end to end transformation impacting customer experience through back-end processes such as claims-processing, underwriting and providing policy quotes. Today, more and more businesses have turned to Robotic Process Automation (RPA) and a Digital Workforce to help streamline their processes in order to remain competitive while being able to delight their customers thanks to fast turnaround times and accurate information. In this "Insurance Industry" special episode of our Blue Prism Café, we welcome guests from Credit Union National Association (CUNA) and New York Life Insurance Company for a conversation around "why" and "how" to implement a Digital Workforce, and more importantly what best practices our guests can share to make RPA a long-term and scalable solution for your business, regardless of the industry. Innovation has always been at the heart of Siemens. In addition to being the largest manufacturing company in Europe, the German conglomerate continues to innovate in a startup fashion and has embraced Digital Transformation and has won their CIO Award based on the work they are doing with RPA. In this episode of our Blue Prism Café, discover how Siemens has been leveraging Robotic Process Automation as part of this Digital Transformation journey--and how their global RPA service, run jointly by the Shared Services and IT department, has enabled their lines of business to realize true efficiency and quality gains along end-to-end processes. You will also get insight as and how they are leveraging some of the latest intelligent automation technologies such as IBM Watson, Celonis and MSFT Azure Chatbot Technology with their Blue Prism Digital Workforce. Ageas is one of the largest providers of personal and commercial insurance in the U.K., and was no stranger to automation when it began using Blue Prism’s Digital Workforce in 2014. But from the very start, it knew it couldn’t achieve its process efficiency, waste reduction, and risk mitigation goals unless it built an internal culture in which everyone in the organization fully understood the benefits of Robotic Process Automation (RPA), and embraced all it could do for them, the company, and its customers. In this episode of our Blue Prism Café, join the team behind Ageas’ leading change management practices, where their goals were to eliminate worries about the impact on employment, actively encourage their employees to welcome process automation, and create a culture in which the employees think of the robots as additional team mates that are responsible for doing mundane, repetitive back office tasks 24/7/365. Ascension is the US's largest independent healthcare provider with over 150 hospitals and over 2500 sites of care, and has leveraged RPA as a strategic differentiator within their business for over six years. In our 12th episode of Blue Prism Café, we explore the various elements that were critical to Ascension's success in deploying their Blue Prism Digital Workforce. Mastering the trifecta of building a solid, scalable RPA foundation, ensuring continued internal adoption and enthusiastic momentum was key during the implementation. Are you asking yourself questions such as "what do I need to anticipate in order to scale enterprise-grade RPA across my organization?" If so, listen to Lee Coulter, CEO of Ascension Ministry Service Center and Shail Khiyara from Blue Prism discuss insight and advice to help you: build a business case, set up a Center of Excellence leveraging Blue Prism's Robotic Operating Model (ROM), and learn how to build in scaling capability from the start. With over 10,000 employees worldwide, Gilead is transforming its business with Intelligent Automation. In this episode of our Blue Prism Café Series, Gilead shares their RPA journey from vision to execution. The company highlights how the Proof of Value was a crucial step for them to derive value from their Digital Workers in under five months. During this time, Gilead also established a solid foundation for the successful scaling of their Intelligent Automation operations by leveraging the Blue Prism Robotic Operating Model (ROM). Join James Sheehy, Director of Business Transformation and Projects at Gilead, as he discusses details of the RPA implementation--beginning with the first few months and ending with Gilead's vision for the future of RPA within their business. James will be joined by Shail Khiyara, CMXO of Blue Prism and Anand Sekhar, Managing Director at KPMG. BCB is a subsidiary of Postbank and is one of the biggest established service providers for payments and banking products in Germany. In 2017, BCB processed over 6.5 billion payments and has about 1500 full-time employees. Cognitive automation is seen by Postbank as one important lever to make banking operations more efficient, faster and scalable. During this episode of our Cafe series, we explore Postbank's RPA journey, which began in early 2016. The bank now has 50 processes automated and is leveraging 40 Blue Prism Digital Workers. Postbank is also looking to combine RPA with cognitive and OCR capabilities to maximize their automation level and achieve faster client-response times. Serkan Saracuz, Head of Organization & Processes shares Postbank's successful implementation process, lessons learned as well as examples and successes with Thomas Bepler of Blue Prism. Blue Prism and Google Cloud recently announced a partnership aimed to drive adoption of Artificial Intelligence and Intelligent Automation. During this episode of our Café series, we explore use cases you can implement today with Google Cloud Machine Learning and Artificial Intelligence. This solution increases the type of front-office and customer-facing automation you can deploy and allows new capabilities to influence an enterprise’s digital strategy. While this may seem futuristic to those who are early on their RPA journey, it’s not too early to explore how to leverage these technologies to up-skill your Digital Workforce to take on more challenging and customer-facing processes. During this session, Vivek Khurana from Pfizer will join Naresh Venkat from Google Cloud to discuss use cases for Intelligent Automation bringing together RPA, AI and ML. DXC Technology is an end-to-end IT services and solutions company, helping clients harness the power of innovation to thrive on change. Through a partnership with Blue Prism, DXC Technology has launched a new digital platform called DXC Agile Process Automation (APA) that combines the availability of the cloud and the power of Robotic Process Automation. APA enables an organization’s business processes to become digital through cloud-based "robotics as a service". Leveraging the latest cloud technologies, the Blue Prism Digital Workforce can be scaled on-demand to meet the needs of businesses through a consumption-based model. Join Stan Leong and Dar Suy with DXC Technology, along with Shail Khiyara of Blue Prism, to learn how the APA platform is enabling businesses to digitize key processes with Robotics as a Service. Join Stan Leong and Dar Suy from DXC Technology to learn how the APA platform is enabling businesses to digitize key processes with robotics as a service. Robotics as a service is delivering real value. > APA decreases change management costs. > APA automates the right opportunities in real time. > APA moves your spend from fixed to variable cost. Johnson Controls creates intelligent buildings, efficient energy solutions, integrated infrastructure and next generation transportation systems that work seamlessly together to deliver on a promise of smart cities and communities. At its core, that promise is about delivering innovation that make people’s lives – and the world – better. In this Blue Prism Café, Steve Sikes, Director of Continuous Improvement for Global Business Services at Johnson Controls, explains how his organization is leveraging enterprise-RPA as a cornerstone to deliver innovative solutions to their customers. Steves shares details about Johnson Controls' two year RPA journey with Blue Prism--how they launched a Digital Workforce that is managing 400,000 transactions annually and generating savings for the company. Process automation has tremendous promise in the HR arena to create efficiencies, improve the employee experience and job satisfaction. As we move forward, digital employees will perform transactional work, allowing our human employees to pivot and focus on the employee experience, which in turn improves the customer experience and bottom line. In this Blue Prism Café, Curt Burghardt, VP of HR Shared Services & HR Systems at Walgreens will share his insights on how RPA is being used to drive strategic improvements at Walgreens. Gerald Pullen, Head of Continuous Improvement and RPA from Lloyds Banking Group along with James Johnson, Client Director EMEA from Symphony Ventures discuss how Lloyds Banking Group formulates the critical elements for building a successful RPA Program. The program puts the customer first, enables self-sufficiency and lays the foundation for future expansion into broader Intelligent Automation technologies such as Artificial Intelligence and beyond. Lloyds Banking Group is a financial services group with millions of UK customers and is focused on retail and commercial financial services. IHG is one of the world’s leading hotel companies with more than 350,000 people working across almost 100 countries to deliver Great Hotels Guests Love®. They turned to Blue Prism to automate mission critical processes after carefully evaluating other RPA vendors. The company was able to launch their RPA program and deploy their first automations in just 12 weeks and continues to scale up globally. Our third Blue Prism Café features Derk Weinheimer, Vice President Cost Efficiency and Continuous Improvement from IHG along with Bill Lloyd, Managed Services Leader from Deloitte. Derk and Bill discuss the challenges of ramping up an RPA program. The program has introduced a new strategic lever for IHG and has helped create efficiencies and increased the value provided from both people and processes. Welcome to Blue Prism's Webinar Channel. - Pulse Online: a product and technology focused webinar series: get hands-on demos, insight and tactical best practices for taking your Digital Workforce to the next level.